Pantalon Montana terminé ! Montana from jacket to pants. En janvier 2008, pressée de terminer ma veste Montana pour le UFO countest de Sewing Pattern Review, je me mets au travail et hop ! une veste complétée en quelques heures intenses. Il me reste suffisamment de ce très beau lin italien afin de me confectionner le pantalon. Six mois plus tard je le termine. Oh comble du ridicule, il reste dans ma pendrie, sans bouton à la taille et avec un ourlet faux filer. Procrestination honteuse ! Et bien un an plus tard, l'ensemble prend finalement forme. Le voilà en entier. J'adore ce pantalon. Il facile à réaliser et il me fait comme un gant. 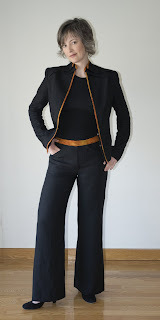 In January 2008, in a rush, I completed the Montana jacket just in time for the UFO countest on Sewing Pattern Review. Since I had over 3 yards of fabric, I had planned on using this amazing italien linen to sew pants. It took me six months to sew them. They were then left without buttons, in my closet until I said enough ! Ayear later !! the pictures are taken, the pants are wonderful. They are so easy to sew, great to wear and they fit so wonderfully. Voilà un patron que je recommande chaleureusement. La couture au centre de chaque jambe dos permet un excellent ajustement au niveau du fessier. 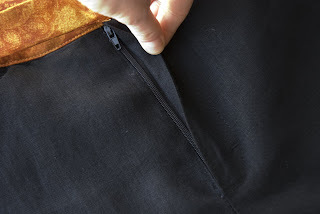 This is a pattern that I strongly recommand, the side back seam allows you to really fit those pants to your shape. I love the way you did the waistband to combine it with the jacket. And I used to love Montana patterns in the 80s, and didn't realize there were still patterns by him with Vogue. L'ensemble est superbe, et le pantalon te va tellement bien ! J'ai bien envie d'acheter ce patron, c'est tellement rare que je trouve un patron de pantalon qui m'inspire. What a fabulous outfit. The pants look like a perfect fit. And the perfect garment to go with the jacket. I love the set, the jacket and the pants are great. 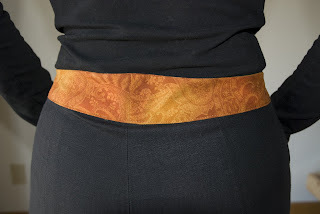 The detail of waistband on pants is a perfect choice. That last comment was from me! I didn't know it wouldn't show my name. :o) Annette. Salut Anne,ça va? I'm trying to find your email, if you don't care, please send it to me. I have to post the drawings for you...a bientôt! Anne,the pants and jacket details are a wonderful idea, it brings the 2 pieces together to give it a very beautiful and polished look! and the fit is perfect! What a beautiful suit! I have this pattern too, and you've inspired me to make it! You look stunning in this suit! Anne.- est belle. Je me souviens de cette veste, beau, et le réglage est parfait. J'aime la structure de la Montana. J'adore!!! I love the orange detail in this black suit! Looks great on you and the fit are perfect! I'm suprised with the collar, very original!